Many examples of the connection between the crucial role played by communist cells in the organized resistance and their origin in Social Democracy. The juxtaposition of the ambivalent posture of the Catholic bishops toward the Nazi regime visa vie the resoluteness of rank and file priests, monks, nuns, and lay Catholics. The defence of the free choice taken by many Communist men and women to return from the security of exile to their annexed Austria in order to rebuilt the broken links of underground organizations that had been decimated by the Gestapo. In their home territory this was seen by the Communist Party leadership as suicidal politics. He gives as best examples the Viennese architect Margarete Schütte-Lihotzky and the Graz architect Herbert Eichholzer. The previously down-played or completely ignored role of the Allied secret service activity in annexed Austria carried out mostly by Austrians in the Allied armed forces by the inclusion of the Austrian resistance within the military’s anti-Hitler efforts to defeat the Wehrmacht. In connection with that, Neugebauer’s recognition of the military significance of the Slovenian resistance in Carinthia should be emphasized, which in the past had been dismissed as assistance for the post-war demands of Yugoslavia. Finally, the appreciation of activities previously ignored or not considered at all: Neugebauer gives examples of resistance to Nazi euthanasia, demonstrates the significance of individual resistance, for example, the loss of self-defence and of desertion; and he deals with the Jewish resistance in which he emphasizes the selfless effect of the Zionist Youth official Aron Menczer both in Vienna, where he saved hundreds of children with passage to Palestine and in the Theresienstadt Ghetto, where he cared for 1,260 neglected and orphaned Polish children who were otherwise destined for Auschwitz and certain death. As important as Neugebauer’s standard work is and will remain for the time being, for inner-Austrian discussion, his greatest effect will no doubt be in the 2014 English translation, which was made possible by the Republic of Austria Future Fund, and thanks to enthusiastic reviews in American journals in the last year and a half will even bring this topic to the attention of those having a general interest in Austria 1938-1945, even if they do not study the work itself. Also, Günter Bischof’s Introduction to the translation of Felix Mitterer’s Jägerstätter play, which will be dealt with later, references Neugebauer’s book. Beside Germany and France, the United States is the country where research and publicity are highly focused on Austrian history and politics, in part as a result of the large number of Austrian refugees who found a new homeland in the United States following 1938, and also because of high interest in German Studies at American universities, focusing on Austrian literature and history of the 19th and 20th centuries, as the programs of the annual meeting of the German Studies Association (GSA) impressively attest. Another result was the coming together of the American Friends of the Documentation Center of Austrian Resistance with the GSA. Thus it is important to know which image of Austrian society during Nazi times dominates historical research in the US. This image of the past 3 decades has been dominated by the “Austrian component” of Nazi crimes. There were several reasons for this. Firstly, as a result of the response to the Waldheim debate, which brought to light the whitewashing of history for foreign consumption, and attempted to completely ignore the Nazi period. Where it could not be avoided, the coercive aspect of the so-called “Anschluss” 1938 whereby a major number of Austrian “compatriots” participated in the humiliation, abuse, and theft of thousands of Viennese Jewish men and women, was simply repressed and hidden. Very quickly during the Waldheim debate, many in America switched their perception of Austria from that of Victim to that of Perpetrator. Secondly, these prejudices were confirmed in the manner by which Austrian governments promptly rejected claims of Nazi victims prior to the conclusion of the agreement between the federal government of Austria and the government of the United States regarding the questions of compensation and restitution for the victims of National Socialism (the Washington Agreement of 24 October 2000). Even in the implementation of the agreement, leading officials still attempted to skirt the spirit of the agreement, which was once again conveyed to a broad audience in the sumptuous 2015 film “Woman in Gold” by the British director Simon Curtis about the fight over the return of Klimt’s “Goldener Adele” to the heirs of Adele Bloch-Bauer. 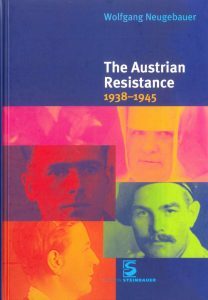 “The Resistance in Austria” was problematic not because of the book per se, but rather that it had no “successor”. Not only resistance research continued to progress (even though academic research focused on it to only a small degree, particularly in the 1990s and 2000s). At the latest, Evan Burr Bukey’s study from the year 2000, “Hitler’s Austria:Popular Sentiment in the Nazi Era, 1938-1945 (2001 German translation entitled “Hitlers Österreich. Eine Bewegung und ein Volk) presented for the first time with broad ranging data, the mood among the Austrian population, which thereby influenced in large measure the emergence and likelihood of success. Meanwhile several studies analyzed an additional factor, without which a presentation of the resistance would not be possible: the Nazi repression apparatus. That added to the growing interest in the attitude of individuals toward resistance. Insofar as Wolfgang Neugebauer included all these points of view in his presentation, he succeeds in historically broad contextualization. The English translation affords access for American readers and thus makes it possible to include the resistance in the history of Austria’s Nazi past.